Just after 1:00pm Central Daylight Time (18:00 GMT) today, Beer Me! welcomed its 10,000,000 visitor! I'd like to buy you all a beer, but at a pint apiece, it would require all the beer that Sierra Nevada will brew this year, and then some. Or if you're really patient, I should be able to get that much beer into Gottberg's tanks by the year 5233. A professor at Yale — back in 1955 — scientifically proved that it's physically impossible for a human to get drunk on beer! THE AVERAGE alcohol content of American beers is 3.7 per cent by weight (4.7% by volume). In order for the alcohol blood level to be at 0.15 per cent, there would have to be two and one-half quarts of 3.7 beer in the stomach. But the capacity of the human stomach is one and one-half to two quarts. So much for 0.08! Read the whole theory at Gawker. I ordered three pallets of malt a couple of weeks ago. There was some confusion over when it would arrive, so I put out a call to the brewers in the area asking if I could borrow some. Their responses were prompt, enthusiastic, and helpful, but now it looks like my shipment supposed to get here today after all. Yesterday, I rearranged the bags of malt upstairs to make room for the new stuff. Today, when the truck gets here, I'll wheel the pallets upstairs and get all the specialty malts sorted out. Then I'll set up tomorrow's brew. Thursday, I've been asked to give a short presentation at the local Rotarians meeting...at 7:00 in the morning. (That's almost an hour before I'm normally awake.) Once that's done, I'll brew a batch of Tin Lizzie Hefeweizen. Friday, I'll clean kegs and fill orders, then go to Omaha to pick up Paris at the airport. Next week, I should brew some All American Gold as soon as I can harvest the yeast from the Porter. I've also had a couple of requests for the Toil and Trubbel Dubbel, so I'll brew that with the Tripel yeast. Don't feel too bad about America losing an icon in the Anheuser-Busch sale. That company has done a whole lot of damage to American beer culture and diversity over the decades. Imagine the Budweiser Clydesdale team on a cross-country rampage, with a decrepit, tipsy August A. Busch Jr. strapped to the lead horse, wearing a bright red St. Louis Cardinals cowboy hat. Starting on the West Coast, platter-hoofed horses trample a can of Blitz-Weinhard, spewing suds all over the streets of Portland, Ore. Moving south to San Francisco, they stamp on bottles of Lucky Lager. In their hometown of St. Louis, they crash through the wall of a Griesedieck Bros. brewery, rolling hundreds of barrels into the Mississippi. They're seen next in Cincinnati, kicking a Hudepohl taster to death. The Clydesdales' tour of destruction ends in Brooklyn, N.Y., where Busch orders them to urinate in a vat of Piels, cackling that no one will be able to tell the difference. Edward McClelland tells a great story at Salon.com. Man spent $1,000 a week on beer? An Australian man convicted of his seventh drink-driving charge was spending about A$1,000 ($972) a week on beer — enough to buy more than 2,500 small bottles a month, a newspaper said Tuesday. "(That is) poor judgment on two counts there — drinking that much and drinking Melbourne Bitter," magistrate Vince Luppino was quoted as saying. Reuters has the whole story. This should keep us busy for a while. George Will explains how beer has strengthened the human gene pool. The gene pools of human settlements became progressively dominated by the survivors -- by those genetically disposed to, well, drink beer. "Most of the world's population today," [author Steven] Johnson writes, "is made up of descendants of those early beer drinkers, and we have largely inherited their genetic tolerance for alcohol." Read all about it at RealClearPolitics. For several years, I've had a page linking a list of beers to Liquid Solutions, a most excellent beer-by-mail store in Oregon. The page was always fairly ugly, though. Last week, Matt Maples gave me permission to use the images from his site to make the page more interesting. I took that opportunity to redesign the page, making it easier on the eyes as well as easier to use. 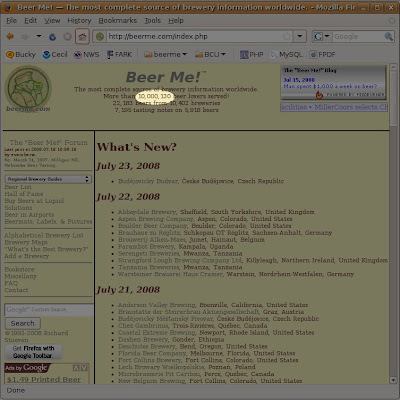 Take a look at beerme.com/liquidSolutions.php, and if you see anything you like, click on the beer to buy it! Monday: Clean the draft lines. Make 42 barrels (1,302 gallons, 49 hectolitres) of Root Beer, 14 barrels of which went directly to the empty tanks in the cellar. Clean/sanitize/pressurize a bright beer tank, and transfer last week's batch of Tin Lizzie Hefeweizen. Tuesday: Clean/sanitize/pressurize two or three more bright beer tanks in preparation for filtering later this week. Fill a couple of kegs of Hefeweizen for the pub, since they ran out over the weekend. Wednesday: Filter the All-American Gold and Blood Red Beer. Thursday: Fill kegs, including 20 five-gallon cans and two half-barrels for the Norfolk distributor to pick up on Friday. Friday: Do everything that I procrastinated on this week, because there's always something. Saturday: Pour beer at the Sunfest in Omaha.